It takes a drought sometimes for a fresh approach to catch on. An NPR Morning Edition program (January 2015) was about the urban planners in Los Angeles seeing the need to view the city as a sponge, absorbing water, rather than corralling, then whisking it away down the drain and into our waterways. “Engineering water into submission” is how they talked about it on NPR and it dates back to the Romans and aqueducts. It also is how I got to the idea of retrofitting existing surface parking lots to be spongy ones as part of my neighborhood work as a sustainability advocate. I live in the Old Town Chinatown (OTCT) neighborhood of Portland, Oregon. One rarely hears the word, sustainability pass anyone’s lips at land use meetings despite the City’s reputation for sustainability, awards for its healthy, connected neighborhoods and a significant number of LEED certified buildings. Similar to skid row landscapes in other medium and large-sized cities, OTCT is peppered with surface parking lots, many waiting for infill or development especially those owned by the redevelopment agency, with centrally located ones returning money in the manner of a cash machine to its owners and managers. After listening to the broadcast, it wasn’t hard to extend this fresh idea of spongy to the problem we face here in Old Town Chinatown. Not only are the surface parking lots signals of a blighted landscape, but planet-wise they waste precious water; pollute as water run-off contains toxins e.g. gasoline, heavy metals, and nasty Polycyclic Aromatic Hydrocarbons (PAHs) with heavy rain days being particularly worrisome as they may result in combined sewage overflow* (CSO); and they contribute to the overheating of our urban areas as heat islands, “pushing air temperatures up to 10°F (5.6°C) warmer than surrounding areas with open land and vegetation.” Portland State University’s Vivek Shandas has lead an effort to map heat islands and make the tool available on-line. Surface parking lots, impervious surfaces, are a sustainability nightmare. The advantages to local businesses of “parking” as a requirement by cities to attract employers and shoppers is hardly offset by the damage to our environment, the health of our residents, the local economy (they are not taxed at the same rate as nearby buildings) and to those elements of sustainability often referenced to as “externalities.” Economic factors, money, often reigns supreme in much of local decision making. Of course the costs to mitigate the damage done to our planet and people is born, eventually, by the taxpayer, those living in blighted areas and our children and grandchildren. The good news lies in retrofitting many of these surface parking lots. Locally we put together a cross collaboration team of architects, engineers, designers, and our resident expert on low impact development also known as green infrastructure, Maria Cahill. Retrofit tools and methods are readily available for conserving water, then returning it to the ground or filtering it for re-use in nearby parks and gardens; decreasing pollution of nearby rivers and streams especially in times of heavy rain days – projected to increase here in Portland in this age of climate change; reducing the heat by increasing the tree canopy; and using rain gardens, living walls, and swales to significantly reduce the harm done by surface parking lots. 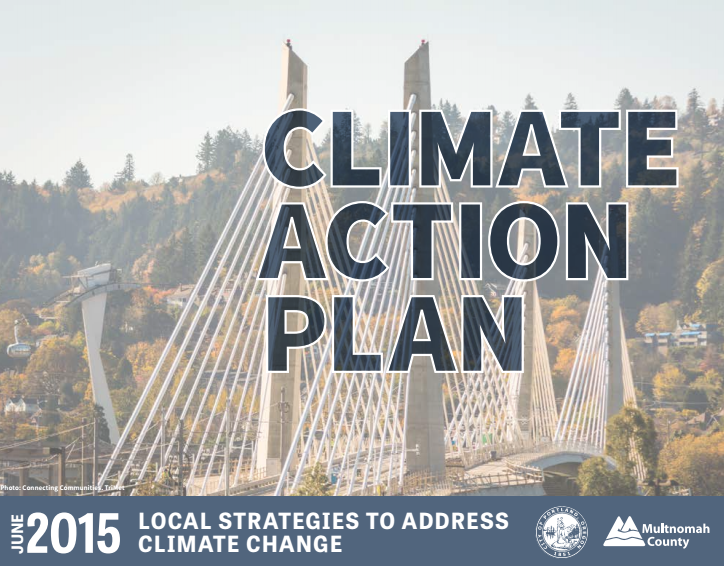 Retrofitting doesn’t necessarily mean a reduction in parking spots if that turns out to be a gating factor in getting local support for a demonstration or pilot project, as we are doing. The effort to retrofit Spongy Parking Lots is an opportunity to take a closer look at mobility options (where “by car” and “more parking” is not the default option for solving issues raised by employers in our central city and by retail merchants and the entertainment/hospitality industry. We have been identifying our spongy champions working in the many agencies that would be involved in bringing a demonstration project forward and raising awareness through social media, especially videos on our PDXdowntowner YouTube channel. There is our webpage at www.spongyparkinglots.com where we have included an overview of spongy parking lots, relevant links to videos, articles and whitepapers, and an overview of our team members. Like our Facebook page to indicate you support thinking spongy when it comes to surface parking lots. *CSO has been a big issue in two cities I have lived in – Portland, Oregon and San Francisco, California. Portland’s CSO Control Program (December 2011) reduced CSOs to the Columbia Slough by more than 99% and to the Willamette River by 94%. 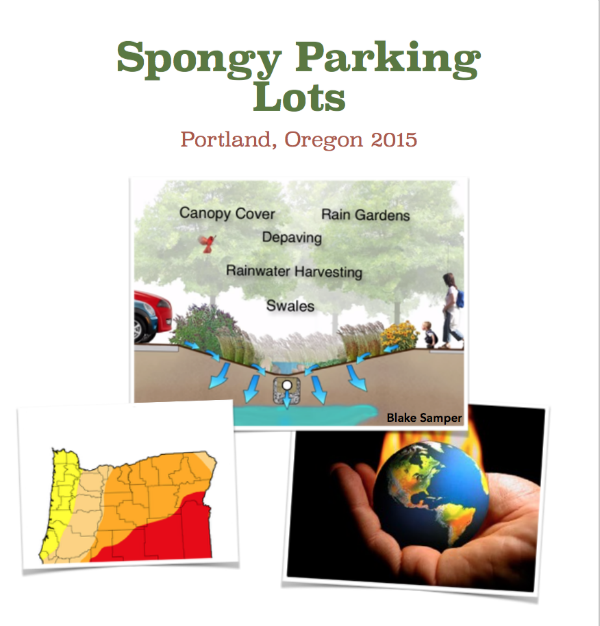 This entry was posted in awareness, Climate Change, Spongy Parking Lots, sustainability and tagged droughts, Green infrastructure, Heat Islands, Impervious surfaces, Mobility Options, Oregon, Portland, Spongy Parking Lot, storm water management, Values and Beliefs, water management on August 31, 2015 by Ruth Ann.